-”The Sea,” Bryan W. Procter. It is at last time to sit down and write Part II of the green Emerald series. This time I’ll go into detail of our solar panel setup and the reasons we have chosen to do what we have. First up is why use solar power on our sail boat. This involves an initial discussion on what we need them for. They are primarily to keep our house battery bank charged. We have a house battery bank of 675 Amp Hours using 6 Trojan T105 6volt deep cycle batteries (golf cart batteries), connected in series/parallel. (this means pairs of two 6 volt batteries in series giving 12volts of 225AH batteries,which are then joined together in three parallel strings giving a total of 675AH). The batteries are wet lead acid, and deep cycle. This means there is more maintenance than other types (checking water levels etc.) but they are very robust, and should last with careful monitoring and maintenance around about 7~8 years of constant use. The bank of batteries itself costs in the region of £800 so you can see that this is a large investment for us which we must take the time to look after well. We are watching the new ‘Tesla Power-wall’ development closely as well, using the latest Lithium battery technology, but at the minute good quality wet lead acid batteries work well for us. Perhaps on the next refresh of our house bank the price/technology will have improved greatly. Therefore to get back on track, our solar array is used to charge our house batteries. In terms of what this means in practice, our renewables mix of sources powers our fridge, freezer (holding 6 months of food), all of our electronics, laptops, TV (watching an evening movie for example), our water pumps (though we do have manual backups), lights, music autopilot and watermaker. We are a power hungry boat, but we took the deliberate decision to make Emerald our home with a good level of comfort, rather than an exercise in masochism! As well as our renewable sources we also have a 110amp alternator on our main Volvo engine and a 2000 watt air-cooled suitcase type petrol generator as backup for cloudy and windless days. However fossil fuels cost money! Therefore when at anchor we try to live purely on our renewable sources ie FREE! Therefore we have a solar array of 524 watts (it grew organically hence the weird number), and a 400 watt wind generator (subject of a future post). 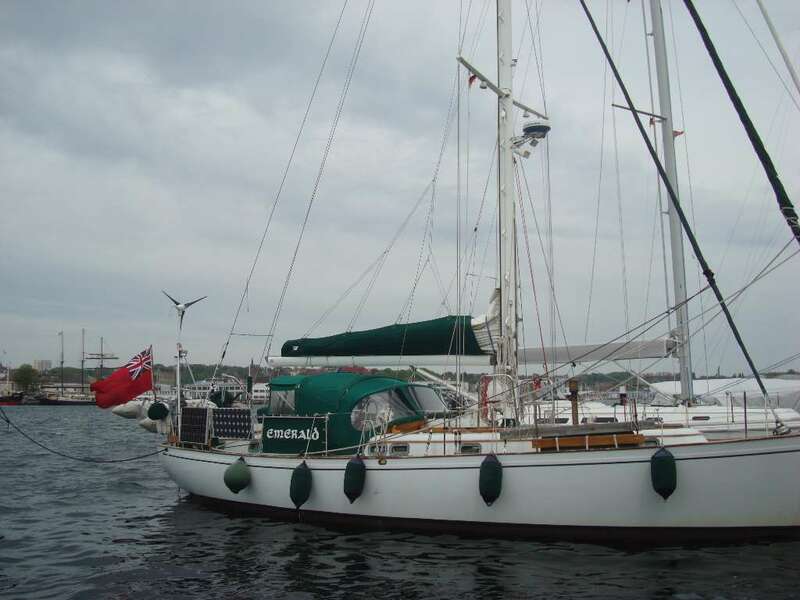 I’m pleased to report that this year 2015 since leaving our winter quarters we have not needed to use fossil fuels at all to charge our battery bank while anchored, and have not dropped the house bank below 80% in that time. We have gotten more astute at managing our usage, but have never felt hampered by a lack of power whether to add beer into the fridge (important requirement) or watch a movie if we feel like it. So onto our strange total of solar watts. Initially when we bought Emerald on 1st June 2004 (soon to be 11 years in our ownership!) we also bought our first set of solar panels. Two 75 watt Siemens panels, which we rarely used as marina dwellers initially. They were mounted on the side rails of the boat as ‘wings’ which could fold out horizontally on Magma mounts. (the mounts were designed to use with fish gutting tables by magma, but worked well). We then decided just before we set off that we would like to increase our solar power further, so bought slightly different panels from Kyocera, who were known for their quality construction. These were similarly rated in terms of output voltage to our original Siemens panels which meant we could parallel the 4 panels together. We did this by adding them also as ‘wings’ on the side of the boat. This second set of panels were rated at 174 watts, or 87watts each (yep a strange number!). This increased our total to 324 Watts. This was still within the limits of our 30 amp solar charge controller made by Morningstar. It uses a PMW (pulse width modulation for you technical geeks out there) control mechanism, which actually suits wet lead acid batteries very well, as the ‘fast switching’ helps prevent sulphation of the battery plates. So we were able to ‘almost’ get by on this array when at anchor on our first few cruising seasons. This was before we learnt really how to manage our power resources and what worked and didn’t work well at anchor. There however were several drawbacks with the ‘wings’ system on the side of the boat. Firstly whilst swinging at anchor the boat can quickly shadow the panels, requiring you to alter the angle constantly to ensure you are charging well. We even coined a new word on Emerald for this. ‘titavating the panels’ which meant that you were constantly checking them to ensure the batteries were enjoying a healthy charge. Not the best way to relax at anchor, and if you leave the boat you may find that a sunny day has been wasted if you leave the boat. I ended up feeling like a slave to the panels rather than the other way around with silent free power. The second problem comes when in close quarters. 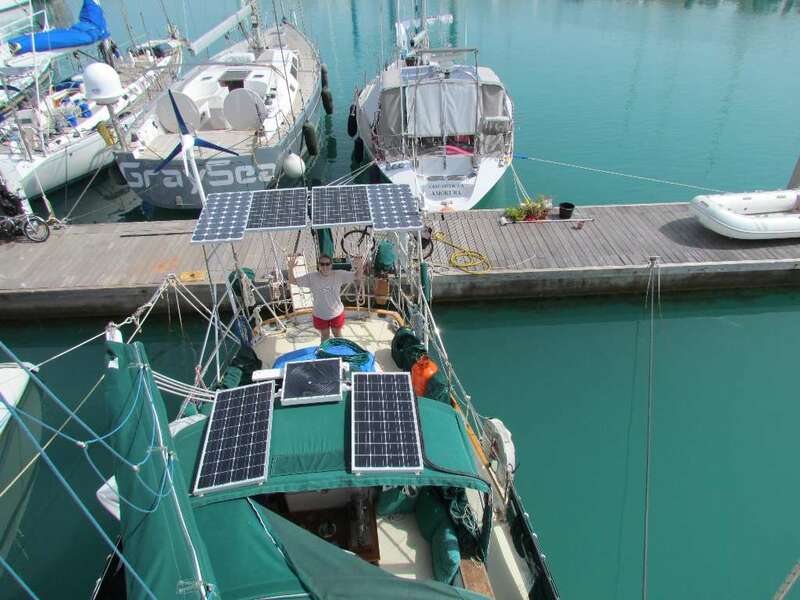 If we are in a marina which charges extra for shore power, then we usually wouldn’t bother with that but rely on our solar. We even had a fluorescent green (of course) small fender we would hang on the outboard end of the panels when they were in the horizontal position to warn other boats, but that didn’t help. I almost lost my fingers trying to get the panels safe whilst a manoeuvring boat in Yarmouth harbour on the Isle of Wight bounced off our dinghy, and our stern quarter at about 3 knots, snapped one of their stanchions and headed round again for a second faster attempt!!!! You have been warned! Crowded anchorages are also risky for side panel mounting. So much so that I know a lot of people drop their panels at night and raise them when they get up in the morning. This can mean losing a few hours a day of power generation each day before you get up. Our final addition to the solar array came a few years back when we undertook a mini refit at a boatyard in Essex, UK. The price of panels had been dropping to about £1 per watt so we decided to add a separate array on top of our bimini made of two 100 watt panels. These are on a separate 15 amp solar controller, giving us a measure of redundancy for our array and add a useful 10-12 amps into the battery bank as required. We still move the boom to port or starboard to minimise shading on the bimini panels when at anchor but this is less crucial with the panels on the arch unless the batteries are particularly low. You can see the boom held to one side on the first photo of the whole array. This brought our total combined array up to 524 watts, which we are happy with. However we keep this under constant review as prices continue to fall. Our original two panels are now around 11 years old, so could probably be upgraded as the efficiency of panels improves and the costs reduce. If we were to upgrade, I would probably swap out the first two sets of panels (the Siemens and Kyocera) for four 140watt panels by Victron Energy (great quality) on our new stern arch and an Outback 60 amp MPPT controller (again fantastic quality), but that is a few years away if at all. As with all things in life there are finite funds available for improvements on Emerald so we tackle things on a priority basis. Our current solar solution and battery technology is working well for us now so any improvements have moved down the priority list, unless of course you work for Victron Energy or Outback Solar and wish to sponsor us to promote your products with real world field tests! However I mentioned our new stern arch. This was initially a difficult decision to make. Buying a custom made arch costs in the region of £1500~2000 for a cheap one which was even well beyond our budget. 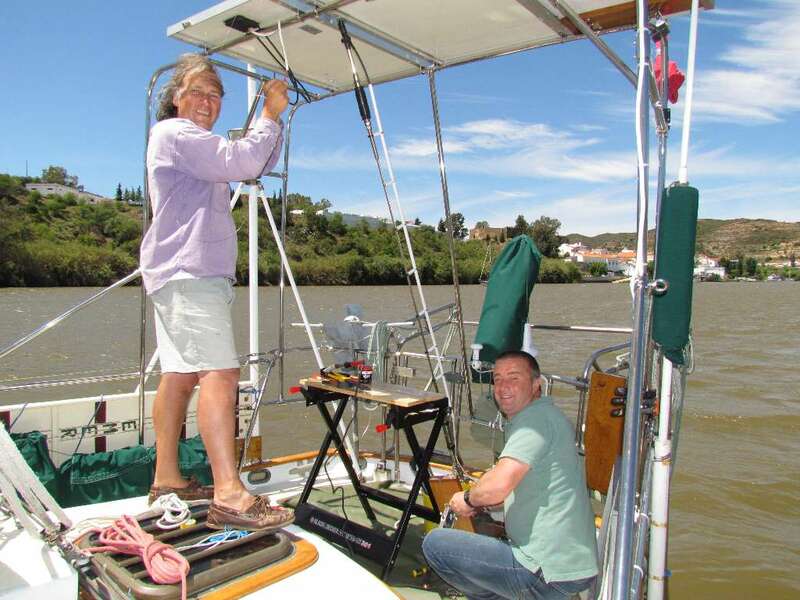 We therefore decided to ‘make’ one ourselves whilst anchored in the river Guadiana on the border between Spain and Portugal. There was a relatively low cost chandlery in Ayamonte at the entrance of the river who would bend 25mm tube to our specifications, so we decided after several designs and careful costings to go ahead. This has worked well for us, and the final cost came out around the £750 mark, which we are pleased about. The arch appears strong and has the added benefit of providing raised mounting points for aerials, LED flood lights, strengthening for our dinghy davits and completely removes the need for ‘titavating’ the panels. The side ‘wing’ panels are now mounted on top of the arch, and ‘just work’. We no longer worry about people crashing into our panels, and as I mentioned at the start of the blog our batteries rarely drop below 80% and usually no more than 85%. The panels are more efficient as they are less shaded being higher up and apart from an ocassional clean require no further thought. Therefore I am definitely a convert to the solar stern arch on a cruising sailboat. So finally in summary on solar panels, our conclusions are, around 500 watts (more if you can, we would go to 680 watts total if the sponsorship comes through!) if you run a12 volt fridge and separate 12 volt freezer, a large battery bank, and for us wet lead acid still makes economic sense. We’ve tried almost all of the mounting options whilst living this cruising life and the stern arch wins hands down. Mount the panels horizontally on the arch, don’t bother with tilting mechanisms, as you will end up not using the tilt in the end, save yourself the expense. I will cover the remaining four projects in further blogs. The Green Emerald series has still to include: Wind generation; prop shaft alternators; water maker; and conspicuous consumption – the LED challenge and energy use reductions, and perhaps a blog on what future projects I would like to do to reduce our carbon (and hence costs) even further, and whether that makes economic sense and comfort sense for us. If anyone has any questions please drop us a note, and we’d be delighted to try and help. If you work for Victron or Outback Solar, you know it makes sense ;-)! Looks really good Colin, how many hrs of watching movies do you get before the batteries drop down to the 80 percent and does overcast days affect the charge capacity. Hi Keith, great to hear from you. We can watch pretty much as much TV as we want. Cloudy days are, usually, a bit windy or squally. We can therefore take up some of the slack with the wind gen.